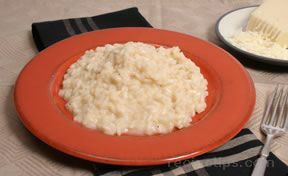 Creamy risotto makes a perfect complement to the sweetness of shrimp. Risotto is a bit more trouble than conventionally cooked rice, but worth it. 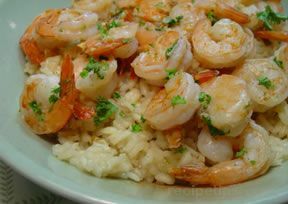 Start the risotto first and prepare the shrimp while it cooks. 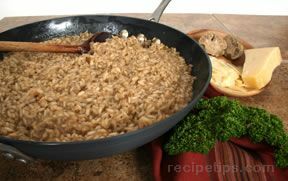 RICE: Heat the oil in a large, heavy skillet. Chop the onion very finely, add to oil and stir until golden, about 5 minutes. Add uncooked rice and stir until all grains are coated with oil. Add 1 cup stock and stir occasionally until it's mostly absorbed. Repeat with second cup of stock. Add wine and stir until it's absorbed. Taste a grain of rice - it should be soft on the outside with a bit of resistance at the center. If it doesn't seem quite done, add water (1/4 cup at a time) until it is done. Add salt and pepper to taste. Set aside in a serving bowl and finish the shrimp. Chop the garlic very finely. Chop the parsley. Squeeze the lemon. Heat the oil in a large heavy skillet over medium-low heat and add the garlic, stirring for 2 or 3 minutes. Increase the heat to medium and add the shrimp. Salt and pepper lightly. Cook for about 3 minutes, until the shrimp turn pink. Turn the shrimp and cook for another minute or 2, or until done. 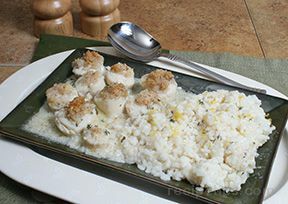 Sprinkle with lemon juice and parsley and spread over the risotto. Serve immediately.